Selling Your House to a Home Buyer – Whats the Catch? Hi. I’m Ben Souchek with The Sierra Group and Home Downsizing Solutions. One of the questions that we often get, is when they hear the advertisements or see the advertisements, that a person can sell a house as is and, in seven days or less, for cash, and make it very easy for a home seller to sell that house and transition to a new home. One of the questions that always comes up, “Is this too good to be true,” or, “Is there a catch in this?” For our company at least, there’s really no catch. What it comes down to is whether the benefits that we offer to a home seller are of value or enough value to make it worth, you as a seller, a home seller, whether that’s a good solution for you. The primary benefits that people work with us, or sell a house to our company for, is, one, from the start of the process, a person does not have to get a house in a show-ready condition. They don’t have to do any updating or repairs that some agents may want them to do before listing a house in a traditional manner. They don’t have to worry about whether it will pass a whole house inspection or any inspections that a typical buyer will want to get. They don’t have to worry about showings, about strangers coming into their house whenever a buyer’s agent wants to show the property. They don’t have to worry about leaving the house at inconvenient times or just being inconvenienced at all, because if we buy a house, we don’t have to show it to anybody else. We are buyers. We don’t get a house under contract and then try and sell that contract to someone else, like wholesalers sometimes do. The other primary benefits is that we make it very easy to transition to your next home. If an apartment or another house isn’t ready quite yet when you want to sell the house, we can still buy the house, but then allow you to remain in your house typically for up to 60, sometimes 90, days to make that transition to a new home, so you don’t have to worry about a vacant house sitting there. You don’t have to worry about moving once to leave your current house and then move again to get to your ultimate destination. We can time that to accommodate your schedule and your transition to make that very stress-free and hassle-free. For more information, please check us out at www.homedownsizingsolutions.com. That’s www.homedownsizingsolutions.com or call us toll-free, 855-291-5005, 855-291-5005. 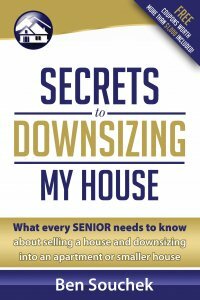 We would be happy to send you a free copy of our Secrets to Downsizing book. Please just mention where you saw us, and I look forward to trying to help you in any way that we can. Thank you very much.